After two decades of above average precipitation and bumper crops, limited rainfall had trickledown impacts of the business "Great Depression" were evident in Mandan. While the drought had less impacts on area agricultural than in the central plains of the US, high unemployment and low business activity were evident throughout the area. 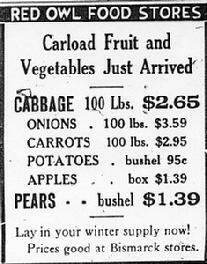 Per state records, in 1933 the average per capital income in North Dakota was only $145 compared to $375 nationwide. Federal WPA/CCC projects in the area included the World War Memorial Building (now Mandan's City's Hall), restoration of the Slant Indian Village earthlodges, reconstruction of the original rodeo grounds and the addition of several buildings at Ft. Lincoln State Park. 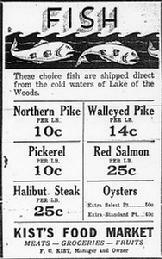 During the early 1930s, the Mandan City Directory listed 16 grocery stores in Mandan, 12 of which had Main Street addresses. Most of these stores were small "mom and pop" businesses, and a few were owned by German-speaking families that attracted immigrant farmers who hadn't as yet learned to speak English. The Kist Market was at 318 West Main St. The Red Owl Store was located at 118 West Main St. In January, fire consumed the rear of the Lewis and Clark Hotel. In May, Fargo architect W. E. Kurke coordinated the repair and expansion of that area of the building to three stories featuring 10 apartments and 10 additional hotel rooms at a cost of $18,000 ($230,000 in 2009 dollars). June 2, 1931 saw the area's first airmail service. Northwest Airways 525 horsepower Hamilton monoplane equipped with "artic" tires left at 8:33 AM from a temporary landing field at the McGillic farm located 2 miles west of Mandan. Of the 324 pounds of mail (or approximately 15,000 individual pieces), 187 pounds originated in Mandan and 137 pounds was from Bismarck. Both cities were competing for selection as single site for the service. The general superintendant and his assistant of the US Airmail Service was in attendance. With the completion of the first floor and indoor swimming pool of Mandan's World War Memorial Building, a four day celebration was held in October with over 4000 people participating from both Mandan and Bismarck. Events included musical entertainment by the Mandan Men�s Chorus and the high school orchestra, swimming and diving contests, lifesaving demonstrations, water stunts, a carnival and a bathing suit style show. Construction on the second and third floors would continue later in the year, with the building finished in 1937. Mandan’s Palace Theatre at 106 Third Avenue NW underwent another remodeling project with the installation of the largest and most modern cooling and air condition system found in the state. According to theatre manager Frank Wetzstein, the machinery, costing $6000 ($105,000 in 2015$) arrived from Minneapolis in three great vans. The system was capable of keeping the air in the theater at 70 degrees even during the hottest summer day. The central part of the system is a giant seven-foot fan weighing two tons and driven by a 10-hoursepower motor. The fan forced cool, clean air into the theater, replacing the room's entire air supply every minute. ND State Employment Service (now Job Service North Dakota) opened their first office in Mandan. In July, high water flows forced the Heart River beyond its banks, causing flooding in the south part of the city, including the Municipal Golf Course. A 3-inch rain followed three days of a total of 3-inches of rain. The Heart River rose over 3 feet during an overnight period. The water swept down 6th Street NW, flushing automobiles in its path. The rapidly rising waters of the Heart River flooded Dogtown (SE portion of Mandan) and the property of the state Training School. It came within inches of the dyke on Riverside Park protecting the Syndicate section (SW portion) of Mandan. As a result of the summer flooding, the Park Board responded with a series of projects to improve and expand Riverside park. After demolition of the existing pavilion, a new clubhouse was constructed complete with basement and screended veranda near the Syndicate tennis courts. The first high school footballs games were also played at the new field installed in Riverside Park. Three taxi companies operated in Mandan and included 57 Taxi, 400 Taxi and this year's newcomer, 20th Century Taxi. Latter was not given a charter to operate by the Bismarck City Commission, but Mandan did not have taxi licensing ordinance at that time. Mandan High School students published their first annual dubbed "Sapakaska" which in the Sioux Indian language means "black and white" which of course are the school's colors. Mandan recorded its highest daily high temperature 115⁰F in July 1936 at the weather bureau at the Great Plains Field Station. The previous winter also saw temperature extremes, this time extremely cold including a record breaking -34⁰F in February. The extended and extreme cold weather was enough to break water mains and residental water lines north of Main Street, turning much of Sixth Avenue into a sheet of ice. Many of the unemployed were rehired by the railroad during the brutal winter weather in February to keep the western tracks cleared of snow to assure shipments of coal continued to arrive. US President Franklin D. Roosevelt visited on August 27. FDR rode through town in an open car with Governor Wallace Welford, behind a cavacade of motorcycles and patrol cars. In Mandan, Rosevelt toured the Great Plains Research Center to view a report on the local effects of the drought, and Nelson Dam located 15 miles north of the city. 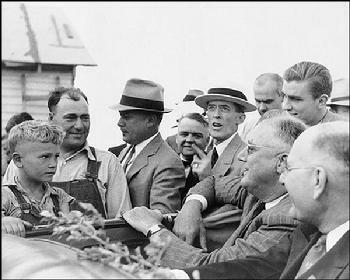 A photo of the President speaking to a Morton County farmboy was made famous in a publication sponsored by one of the Depression Era federal programs. A 400-foot long pedestrian underpass was installed from downtown's Main Street beneath the NP railyard to the city's south side. The concrete lined "viaduct" extended south from First Avenue NW was dug by hand by two separate crews each starting from opposite ends and installed at a cost of $33,000 (or $510,000 in 2010 dollars) despite a project bid of $28,000. The request for the pedestrian underpass had originally been presented in 1934 when residents of Girard's and Syndicate additions sought it to prevent children from crossing the tracks to reach schools. Older residents also crossed the track at unauthorized points to quickly access downtown Mandan rather than walk the several extra blocks to crossings at 6th Avenue NE or 8th Avenue NW. (The tunnel was closed in 1980). A new signal light was also installed at the intersection to accommodate foot traffic at the adjacent pedestrian crosswalk. The November 1936 elections set records for voter turnout occurred across North Dakota as well as in Mandan and Morton County. Mandan residents cast a record-breaking 2,823 votes, the previous record was in 1932. Based on the number of Mandan’s ballots, officials are claiming that a census now would show well over 6,000 residents in the city. William Langer (formerly Morton County's States Attorney) won in a come from behind race against incumbant Republican Govenor Welford with a margin of less than 2,300 votes and Democratic candidate John Moses. In Morton County, returns indicate James Hanley, Jr. has defeated C.F. Kelsch by 72 votes for the office of States Attorney. North Dakotans also voted to legalize liquor by adopting an initiated measure which put the state in the “wet” column for the first time since statehood. Mandan's J. C. Penneys store would move to a larger location on West Main Street. The store had been operating from 216 W. W Main Street since 1920. The city grieved went a murder-suicide took the lives of the entire Macklem family, speculated resulting from a domestic disurbance. August Sr., suffering from poor health and recently unemployed, left a note indicating the first shot was an accident, and after that "I lost all sense of reason." His wife, son August Jr., daughter-in-law and baby grandson were found shot to death at the younger Macklem's home west of his parents residence.